Thanks for being a member! Your commitment is part of our success. And, as a financial cooperative, we can do greater things with more members. So, can we meet your neighbors, friends, family or co-workers? Plus, City & County Credit Union households save $408 in yearly fees compared to the National Average. Help your friends experience the City & County Credit Union difference, and we'll reward you. Start spreading the love and enjoying the benefits of belonging to a not-for-profit financial cooperative. New member must open a checking account and set up direct deposit for new and current member to receive $25. 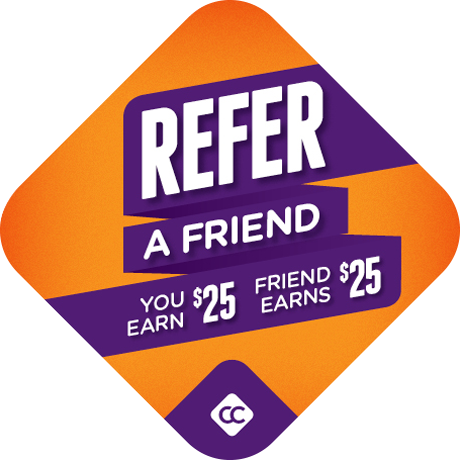 The referral bonus will be deposited into both accounts once the first direct deposit is received. Referral form must be presented at account opening. Referring member must be in good standing. Offer is subject to change and cannot be combined with any other offer. New members only. Source for Household Fees: Raddon Financial Group.